Twenty flotillas of tall ships will arrive in Boston Harbor on June 17th for the magnificent Parade of Sail at the Sail Boston Festival. 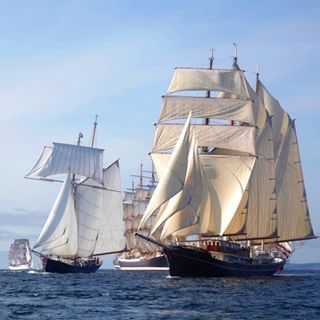 Featuring the largest fleet of tall ships since 2000, this regatta and waterfront celebration honors the city’s rich maritime history and heritage. 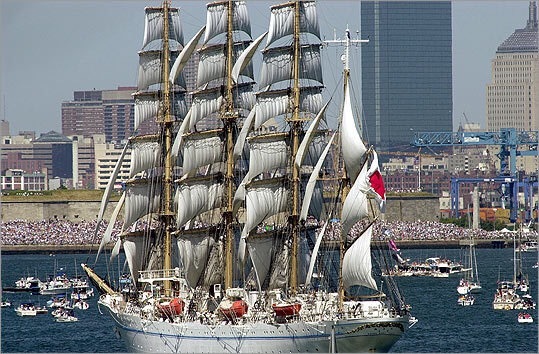 Taking place from June 17 through June 22, Sail Boston kicks off with the Grand Parade of Sail, featuring dozens of tall ships just arriving from Bermuda. After the ships reach their berths in Boston Harbor, the public is invited to visit the boats and enjoy the festival. Head to Boston Fish Pier and Charlestown Navy Yard to find a vibrant party with live music, military entertainment, food, and ship tours. Find the entire schedule of Boston events during the festival weekend on the on the Sail Boston website. This coming weekend check out our Sail Boston tall ships photos as it happens on TheSomervillenewsweekly.com as well as on BostonNewsGroup.com news sites that will be photographed live from aboard the Miss Somerville News Weekly II.